An Arizona wild life web site. This is just a fun web site for me to show off my fotos. There are many large images please wait for them to load. So far it is open to the public and visible with 8, 10, or 16 power binoculars. 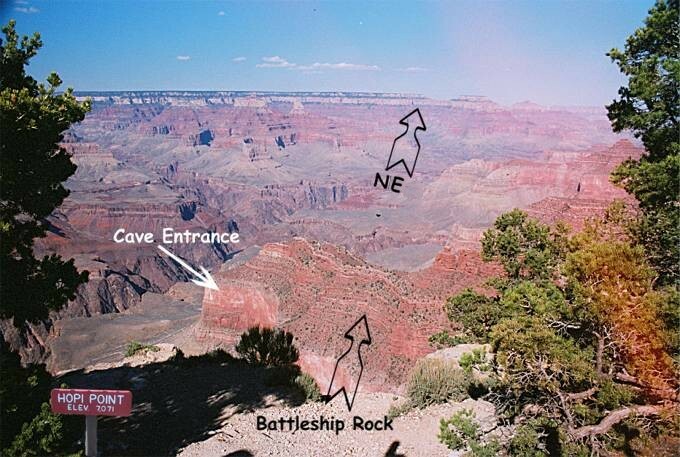 You have to take the West Rim shuttle out to HOPI point. Get off shuttle here and proceed back East along the road about 50 yards to the other, or East part of Hopi point. Chances are you will see others looking at it, but if not, go to the East side or along the low stone wall along the north side. Below are a few photos to show you where it is. 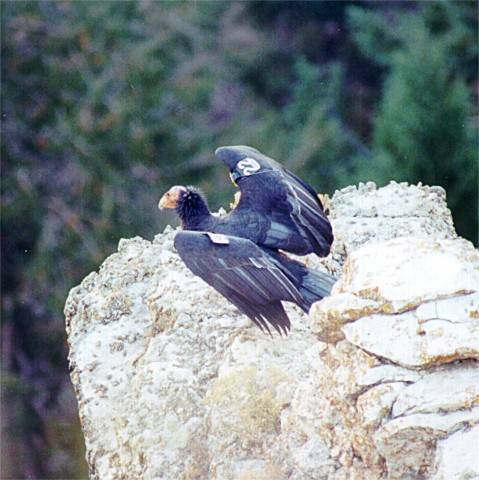 Condors reach sexual maturity & attain adult plumage & coloration by 5 or 6 years old. 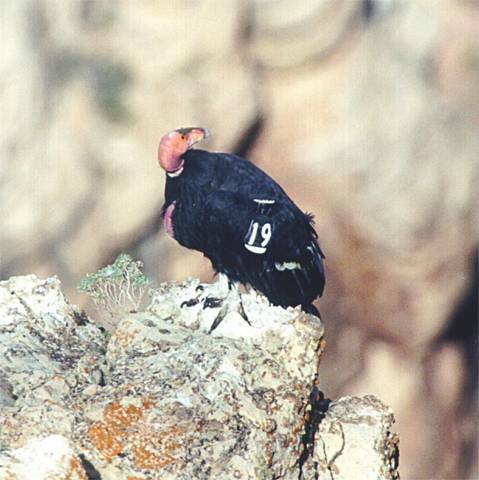 Generally the immature Condor has a dark or blackish head instead of the adult bird's reddish hear. 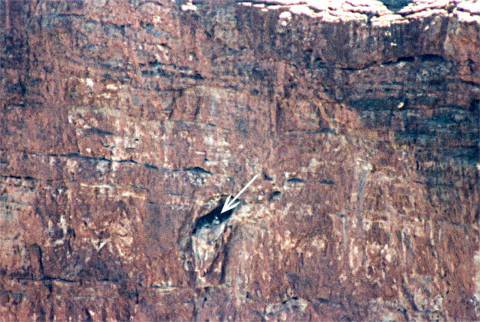 However, the adult Condor when cold can cause a black sheath to cover up its neck and head. There is no viable difference between the makes and the females. 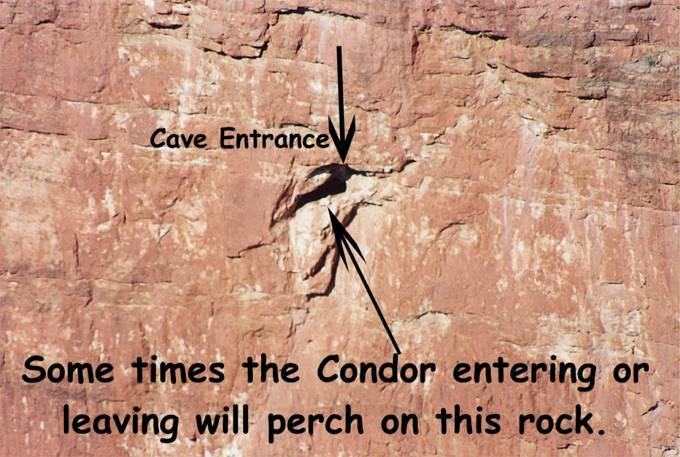 Unless your a Condor the way to tell the difference is with a blood test. They find their food visually, they often will investigate the activity of other scavengers such as Eagles,Coyotes, Ravens. If the Condors are flying overhead note the wing tag number. 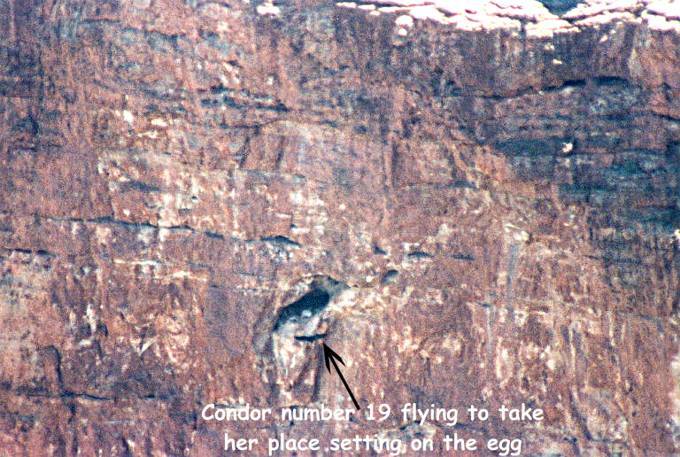 and learn all about the Condor(s) you may have seen. Last year a nest here failed. 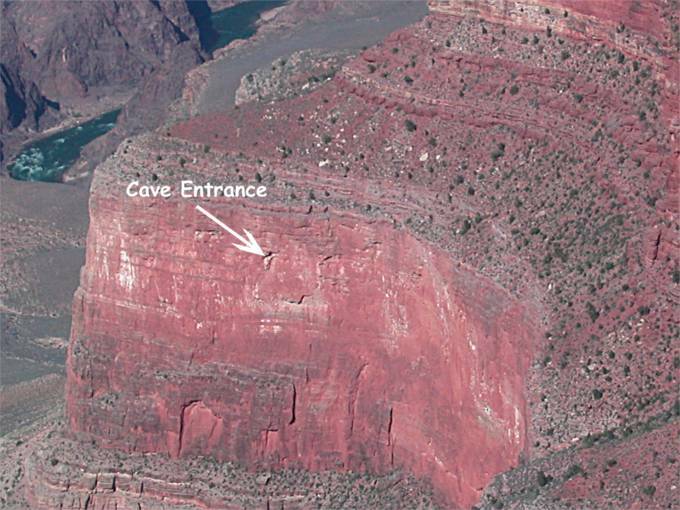 The park biologist repelled down some 170 feet or more to this cave entrance to see what possibly may have gone wrong. Remains found in the nest cave were from the pleistocene area which in geologic terms is from 10,000 to about two million years ago. 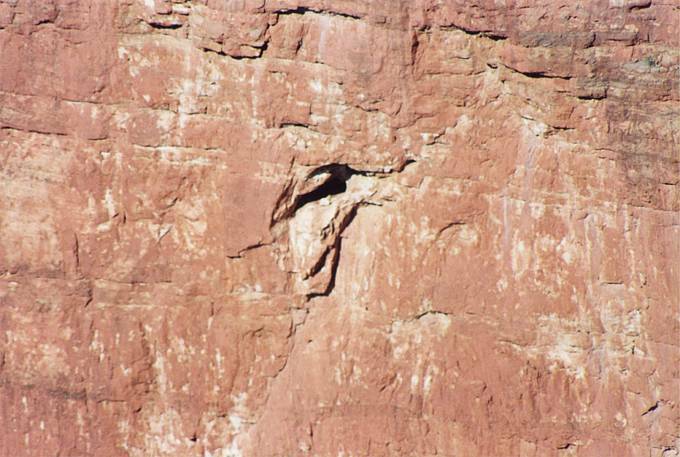 The juvenile and adult condor remains were Carbon 14 dated from 11,000 to 23,000 years ago. Remains of of at least three extinct mammals were also found in the cave, an extinct horse, bison, and brush ox. I don't know nor did I ask if I could put down the names of the people that told this so I won't unless they ask me to. When you get there this may be the scene you will see. Standing in front of this sign it will be to your left. 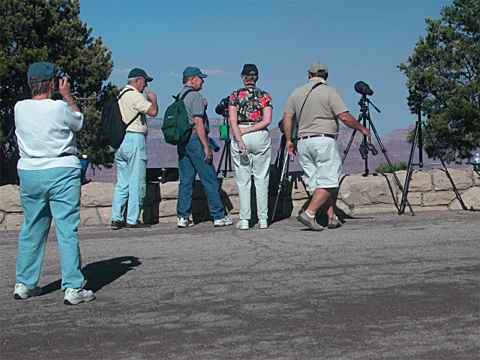 If the Condor nest watch person is there, there may be a scope or two already set up for you look through. OK, let's find Battle Ship Rock. 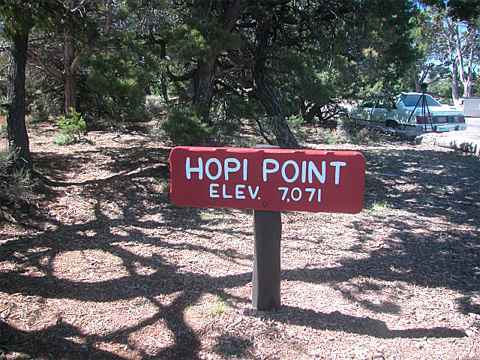 The Hopi point sign really isn't there, I just put it there to show it's Hopi point. In talking to the park biologist I learned that he has repelled down this cliff some 170 feet plus and actually went into this cave. It was before this years pair of condors laid their egg. 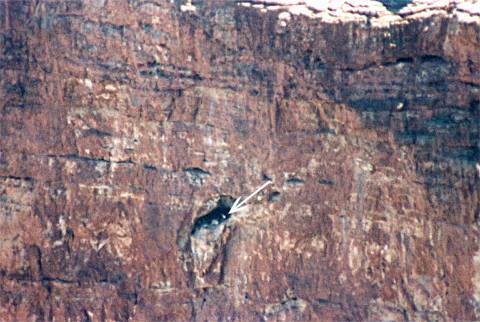 The year before last the condor's had an unsuccessful nesting. Besides the broken egg shell fragments they found some fossilized mammal bones and condor bones. When ask the age I was told 10 to 15 thousand years or older. Personaly I don't believe the condors have a built in ability to use nest site, it's just a good location and they see it and use it, and have been using for a great many thousands of years now. This image is with a 500 mm lens plus two 2X tele-converters on it. If I add a 1.4X tele-converter on my lens with what I already have it looks like this. Let's see now, 500 mm plus two 2X's equals 2000 mm, plus a 1.4X equals a 2800 mm lens. Why it's number 22 coming off the nest it has been on for over 24 hours. Remember now, we are 7/10ths of a mile away from that wall. In case you don't know how far that is in feet, it is, 3696, that's 3 thousand, six hundred, & 96 feet from my camera. 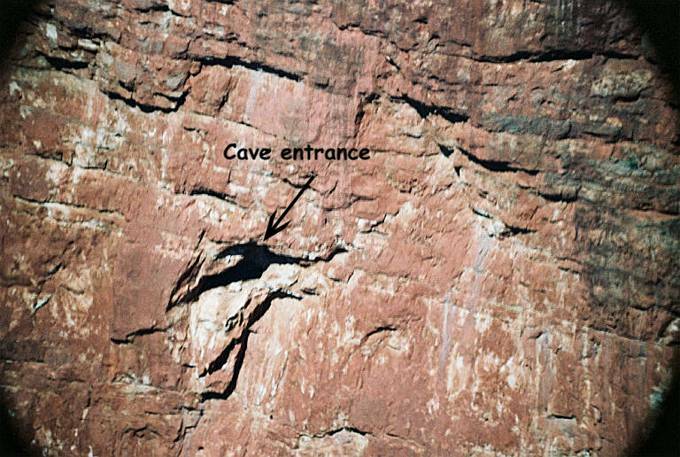 I have shown these 2 images together in order to show you the white spot, number 19 is moving into the cave. We really do need to have a better view of these two birds, so here it is. Number 19 is the hen and number 22 is the male. 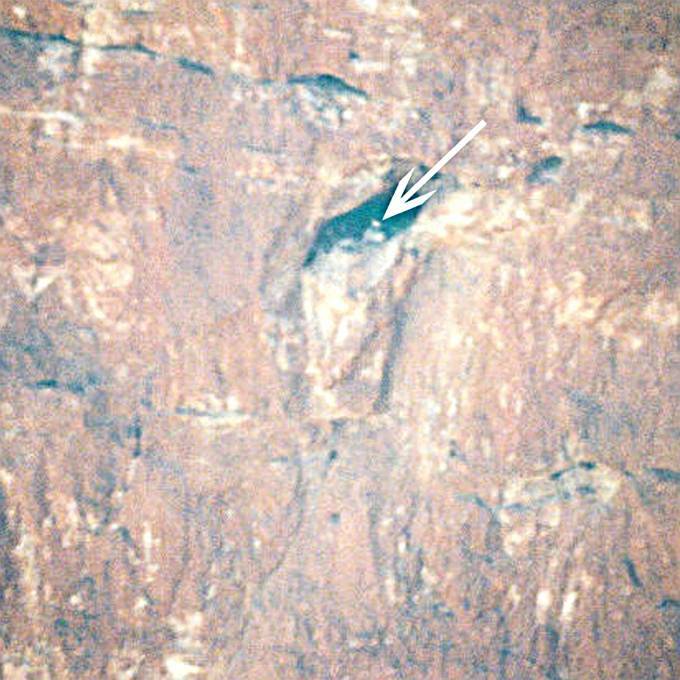 10/20/04 New images of parents and chick in the cave opening.